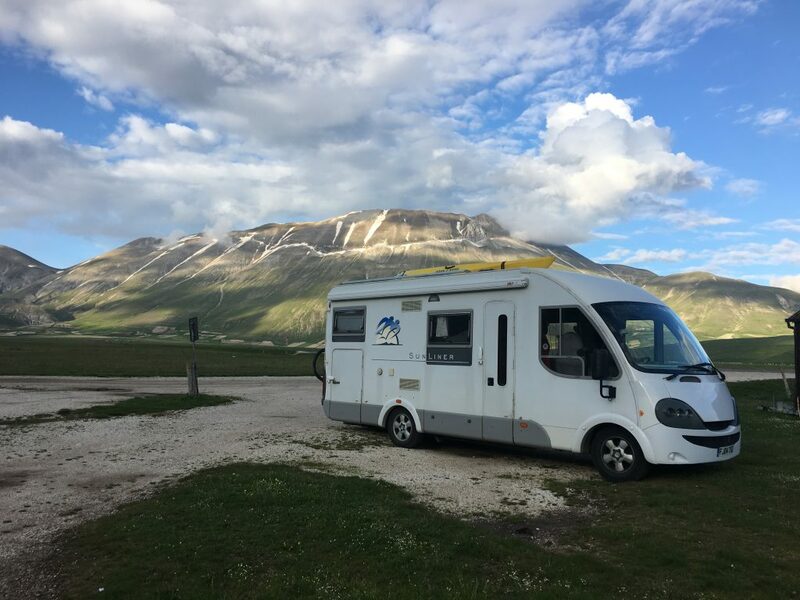 We were continuing our homeward journey northwards and the next stop would be the Sibillini national park. This area was hard hit by multiple earthquakes in 2016 and we knew it would be potentially difficult to get around with multiple road closures and ‘zona rosso’ marking no-go areas in many villages and towns. Fortunately the tourist office website had a really useful map showing the roads, towns and footpaths that were closed. From this map we worked out a route that would take us through the national park via stops at Monte Vettore and the Piano Grande to emerge the other side at Norcia. 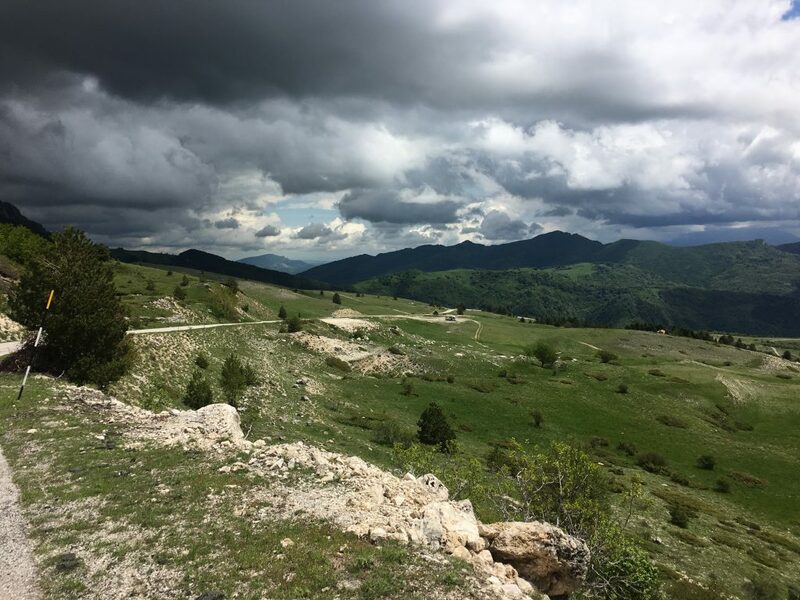 As we drove along the SS4 we saw many signs warning us that the main road to Norcia was shut so we hoped that our reading of the map was correct and we would be able to take the back roads. We turned off the SS4 at Arquata del Tronto and immediately started to see earthquake damage at a level we had not seen before. The town was reduced to rubble in many areas, some of this was due to deliberate demolition, some of it was just the result of earthquake damage. Some houses still stood, looking perfectly sound from one side but open like a dolls house from the other, with furniture still in the rooms. Army personnel were parked in various spots along the road and construction vehicles went backwards and forwards. After our first exclamations of shock we were quiet as we drove through the town, feeling guilty for driving through and rubber necking at the devastation. The road took us up through more similarly ruined villages until we breathed as sigh of relief as we emerged onto the mountain roads. We stopped on a flat car park under slopes of Monte Vettore with views down into the valley. 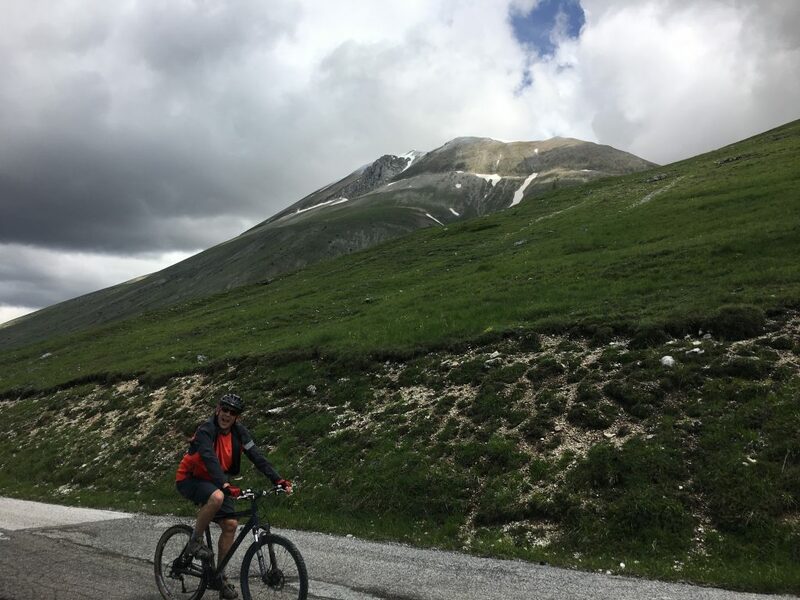 We spent the afternoon mooching around the area, taking a short bike ride up to the start point for the walks up Monte Vettore and walking the paths and tracks around the parking area. The following morning we started early and moved up to park opposite the start point for the walk where there was plenty of parking, just not quite as level as our spot. 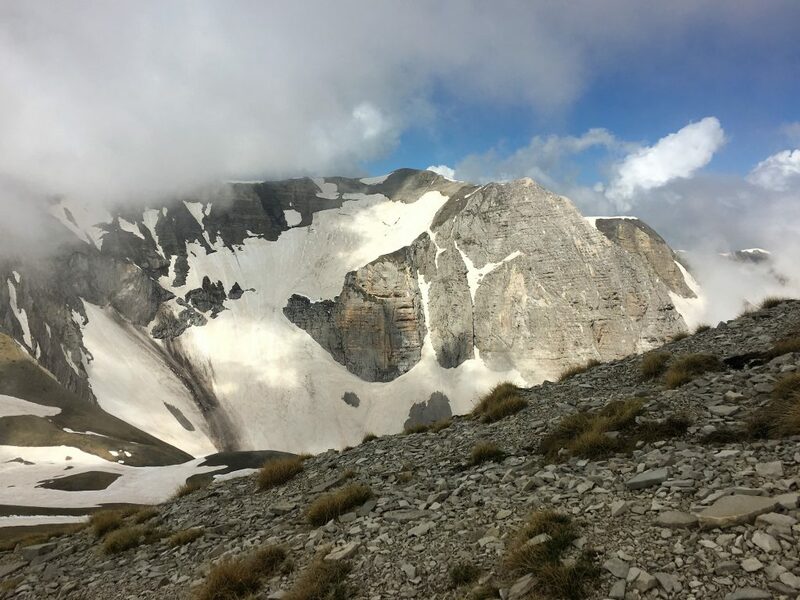 From here we were hoping that we would be able to walk to the summit – it’s not a difficult mountain, but is still well over 2000m so there would be snow on the top. 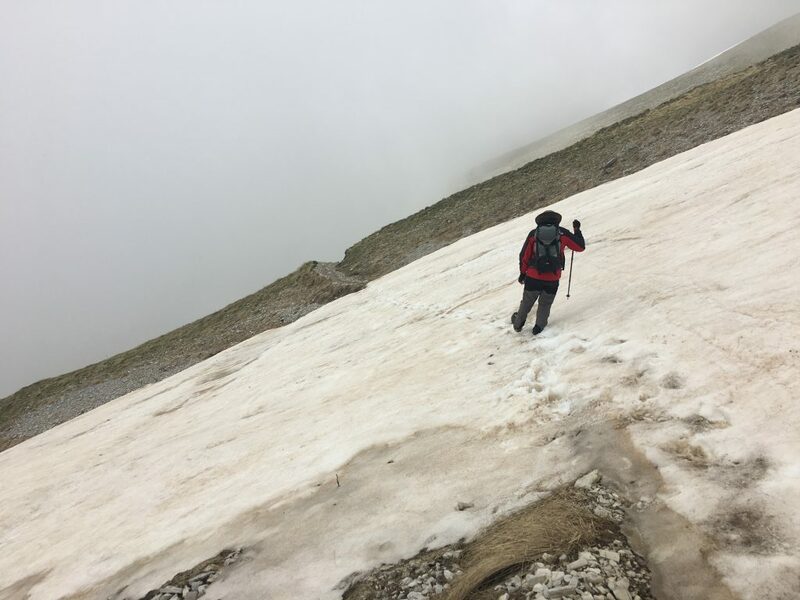 The theory was that the easy path would mean we would find it easy to cross or avoid any snowy patches. We set off in fog, unable to see much, but as we ascended the fog started to burn off giving us voccasional views over the surrounding countryside; on our left the unnaturally flat Piano Grande, on our right the green foothills of the Sibillini and up ahead the summit of Monte Vettore and the more impressive snow bound ridge that leads to Cima del Redentore. There wasn’t much tree cover here, grassy slopes were the order of the day, luckily the weather was cool – just right for walking – and we didn’t need the shade of trees. At the rifugio (closed due to earthquake damage) we stopped for some snacks and to inspect the route in more detail. There was plenty of snow, but mostly on the flatter sections so we were good to go. Only one patch of snow gave us any concern, not that it was steep enough to have injured us if we had fallen, but it would have been an embarrassing slide to the bottom and trudge back up again. Kicking steps in snow is a bit laborious but I let Paul go first! 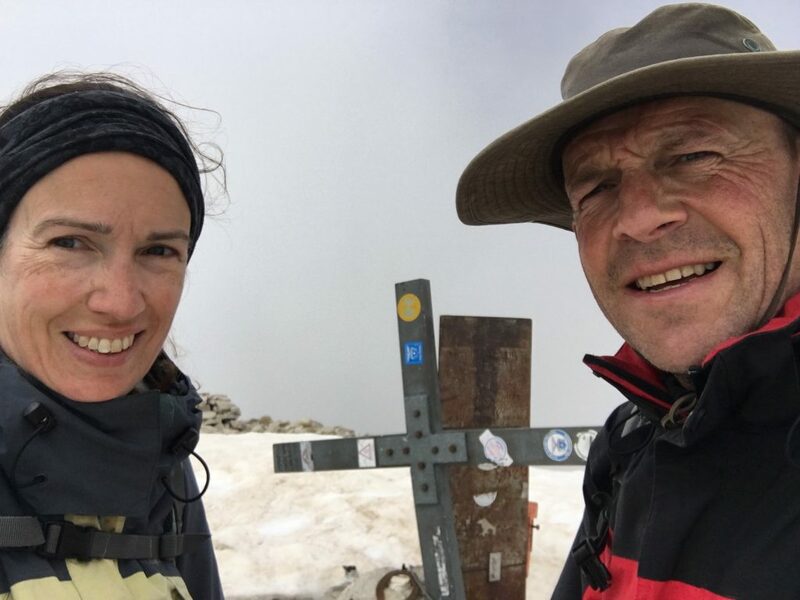 Finally we have managed to reach a summit, it feels like forever since we were last on the top of a mountain. When we got back to Bertie it was still only lunch time, so we moved on onto the Piano Grande for the afternoon. This area, translated as ‘Big Plain’, is exactly what it says. Once it was a glacial lake and the sediment from the lake has formed a wide and completely flat plain ringed by the Sibillini mountains. It is hard to describe how beautiful it was; the expanses of wildflowers bobbed their heads in the breeze, sheep and horses were being grazed on the plains. The only buildings look very temporary, wooden corrals for the horses and farm equipment, caravans for the shepherds. We parked by the ranch in their carpark in the centre of the plain, selfishly hogging the only spot that seemed to be firm. They charge at the weekends and during the summer, but today it was quiet, just us and the ranch workers getting on with their usual jobs. 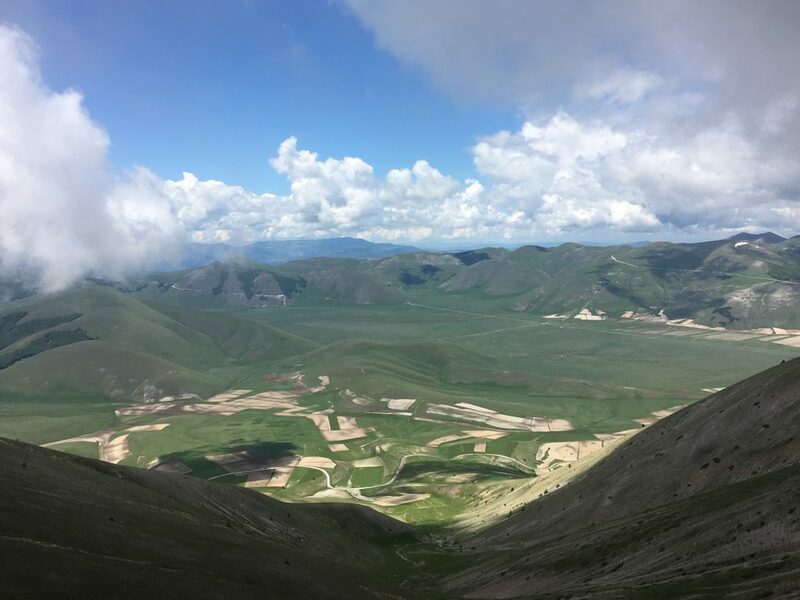 In the distance is the village of Castelluccio – the only settlement here and another village devastated by earthquake, residents only started to return this year when the road was re-opened. Our attention was caught when a shepherd walked past with a huge bag of mushrooms, then we saw an old fiat panda driving up and down the road and an elderly couple getting out and inspecting the ground every few yards. 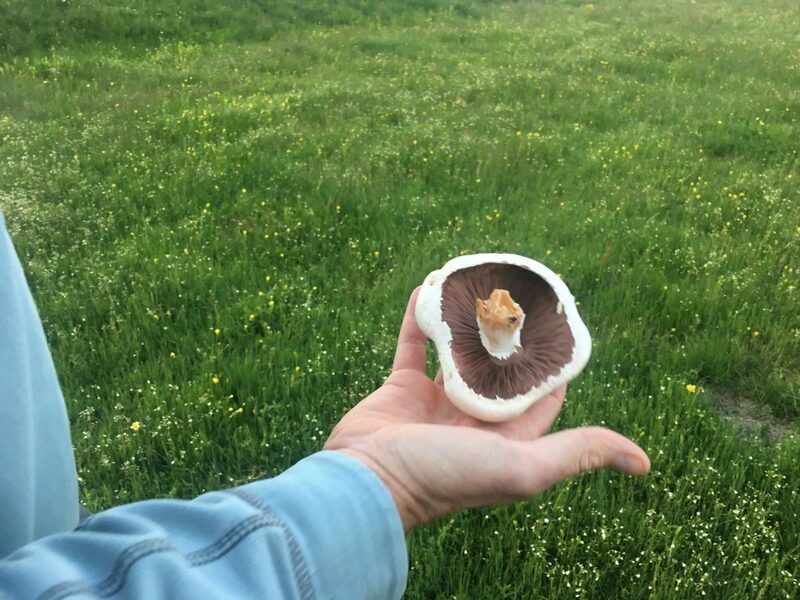 I don’t like mushrooms, but Paul is a big fan so we went on a bit of a hunt, wandering across the meadows with our eyes on the floor. Eventually we spotted a rock…oh no, it’s not a rock, it’s a mushroom. Paul was chuffed, it was the only one we found but a biggie. We contemplated staying here but we couldn’t find anywhere to empty the toilet and it was getting close to full. We stayed for the night in the peaceful stillness, before we made our way out of the plains early the following morning. 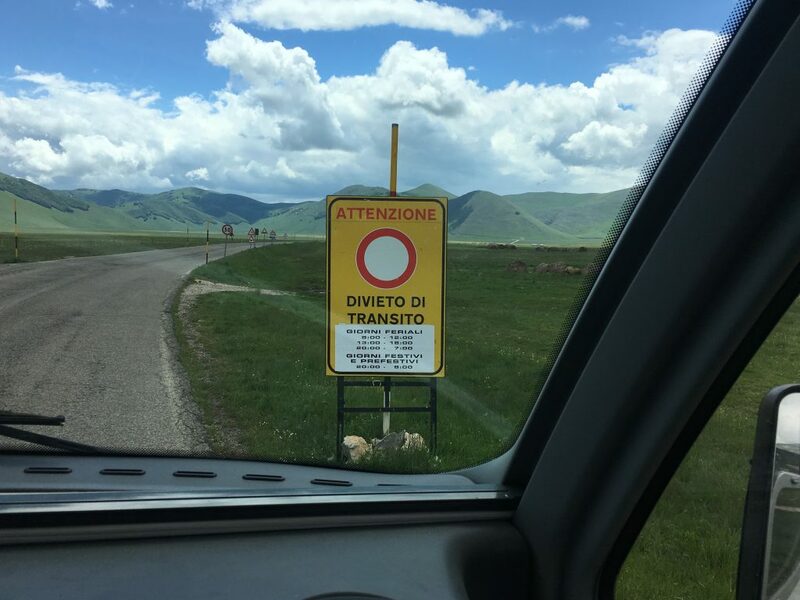 One of the things our map hadn’t told us was that, although the road to Norcia was now open, it wasn’t open all the time. During working hours it was shut so that work could continue on repairs. On weekdays you could only travel early in the morning, lunchtimes and early evening. Overnight travel was banned. We had spotted a few cars driving up to the barrier and then having to turn around, we were thankful that we were leaving on a Saturday so we didn’t have to stick to a schedule. I always make a point of photographing signs like this so that I can work out what they’re saying later!